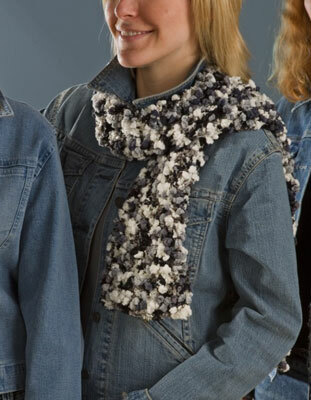 This crocheted smart scarf is textured and bold. The smart scarf gets its tongue-in-cheek name because the pattern looks complicated but no one will believe how simple it is to make! Crocheted with loosely worked single crochet stitches, the scarf pattern is revealed as the yarn rolls out. With the onslaught of new yarns available, creating spectacular-looking designs without having to be an expert is easier than ever, as this project shows. Grab your hook and yarn, and jump right in! Gauge: 6 sts and 6 rows sc = 3 in. Row 1: Sc in 2nd ch from hook, sc in each ch across (12 sc), turn. Row 2: Ch 1, sc in each sc across (12 sc), turn. Repeat Row 2 until scarf measures 62 1/2 in. or desired length. Fasten off.